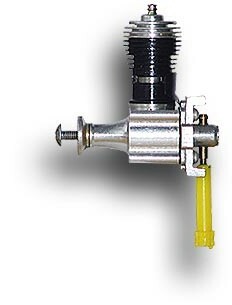 Tarno Carburetor for .049 Engine - I need one engine mount (sheet metal) for the rear intake R/C carburetor. a German Cox clone, circa 1960 (manufactured by R. Brauer Feinmechanik, Berlin). I am not sure whether this engine made it into the hobby shops or died in its prototype stadium. At least it was shown at the Nuremberg toy fair and had been tested by a German model magazine. Information about the promotional film "Wally wins his Wings" (1962) - Looking for copies which could be used to conserve a duplicate on a more recent medium, like DVD? 1950s, 1960, 61, 62, 63, 65, 67, 70, 71, 72, 73, 74, 76, 77, 78, 79, 80, 84, 86, 88, 89, 91, 93, 94, 98, ff. 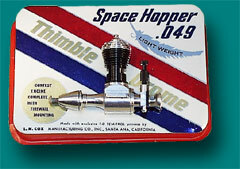 If you have one of these engines/parts or other items in good or fair condition, maybe still in its box, and want to give it away, trade or sell it, e-mail me (see address at bottom of page). I am also interested in parts and incomplete engines, which might otherwise end up in the trash can. Often these can be used to restore other incomplete engines or to improve the look of engines with damaged parts. The same is true for paperwork of any kind. I am not interested in selling these items but prefer to swap them for things from my Wanted list or other interesting Cox material. I have two which are in very good used condition and complete. Unfortunately no accessories or paperwork. Would swap each for something like a good Space Bug Jr. I have several of the early engines in good, but used condition. 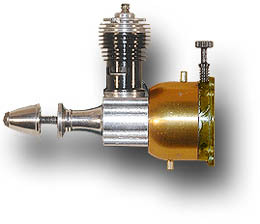 These have either the silver or the golden narrow neck crankcase and the needle with the large, flat head. Usually slight scratches on the fuel tank, but nearly invisible. Would swap each for something like a Space Bug Jr. in similar condition. I have two very good, slightly used engines complete in their bubble pack. The inlay cards are different from the one shown here, as they are printed in plain colors gray/yellow instead of silver/gold metallic. I have not been able to find out more about these cards, but I know that these are original, no reprints. Over the last years I have seen both card types on eBay. Would swap one for for a Strato Bug or for a Thermal Hopper with cage mount in its bubble pack.